The stream started on time with Edward Lewis and Sandro Sammarco, lead designer. The biggest focus of today's stream was the new passenger mission system and the Beluga liner. It's a huge ship, larger than the Type-9 that's dedicated to passenger transport and sightseeing. Even though, every ship in the game will be able to equip passenger cabins (new type of internal modules), only the dedicated transport ships like the Orca and Beluga will be able to carry the best ones providing first class passage for anyone willing to pay for such a service. The missions alone will differ depending on the state of the systems. So for example, if the system is in a state of war – refugees will try to get out, while military outposts from the neighbouring systems might want to send their troops in. Also, there will be special VIP missions that will need you to carry special named NPCs to a specific location, or through several of them. These missions will be dynamic and might have various extra requirements like multiple stops or getting extra commodities like food and drinks. These look like to be optional so far. As in real life, passenger missions need special attention. You can't just pick up a bunch of people and go about your own business. If the passengers find their journey not enjoyable, they will either leave you without payment when you dock, or in more extreme cases, use their special eject pods to get away from your ship. Along with drop locations or sites you have to visit, players will be able to find and scan tourist beacons. These will include various lore info or, in case of places of outstanding beauty, info about the players who actually submitted the location. Players will also receive exploration reward for finding and scanning these devices. As seen in the leaked video, patch 2.2 will be focusing on ship launched fightes. These actually come in 3 different variants: The Imperial Fighter, the F63 Condor and the Taipan. The first two are already known and can be seen ingame (CQC and combat zones), while the Taipan is actually the most powerful of the three. Players will be able to fly these ships manually and leaving their ship behind – in which case, the ship will use all turreted weapons automatically, or – launch the fighters to fight for you controlled by the AI. It is said that some ships, depending on their type, can fit up to 10 fighters! Frontier managed to squeeze in some other info about quality of life changes in the upcoming patch. Station interiors will now reflect the actual state and / or type of the system. They will come in various styles but the interiors will not change. Also, the jump / witchspace animation is getting a facelift. A lot of people complained about the original one, especially while in VR or large ships. So Frontier changed it but a lot of people found the “new” one also poorly made. Mostly because of the 2D nebula sprites used and the weird way of pop-ins. All this is changed again, and now – during jump, we will actually be able to see the star we’re jumping to in the distance. Planet surfaces are also getting a facelift with the new geological structures. These new structures will be harvestable and come in different sizes and shapes. However, it is still unknown will they be used for anything else. One of the best received changes during the stream is the new route plotter. Apart from just setting a destination, it will be possible to filter out specific systems and plot a custom route with these filters. If the map cannot be plotted directly – it will fall-back to the last possible route setting. 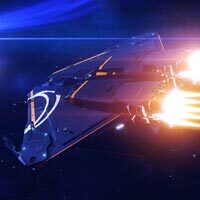 Also, players will be able to transfer their ships to specific stations of choice without actually having to fly to get their ships themselves, as well as pay the fines remotely without having to visit the system where the fine is active. Unfortunately, today wasn’t the day Frontier said anything about Aliens, but – there was several tease-moments where the unknown probe jammed the interview with David Braben, and a distorted shot of a massive debris field was shown. Make sure to stop by tomorrow for the upcoming news! Until then, take a look at the playlist of all the videos shown today at the Frontier booth. I never buy into the hype but Frontier is slowly building up to what they promised. By the time season 3 ends I'm almost sure it will be a massive, yet polished, game with all the featurea StarCitizen keeps promising us - just without a 1000$ ship pricetag. Keep it up mr. Braben!